So far I have gone to the gym twice this week, the third time will be tonight. I have stuck to my meal plan with the exception of last night. I am not seeing any progress on the scale (239) but I think that has to do with some night time binging that has been occurring. I am not sure what the trigger has been but I am trying to get it under control! I am thankful that I haven't gained any weight this week and I know that I would have if I wouldn't have been sticking to my meal and workout plans as well as I have been! Without this challenge, I don't even want to know how much weight I would have gained. 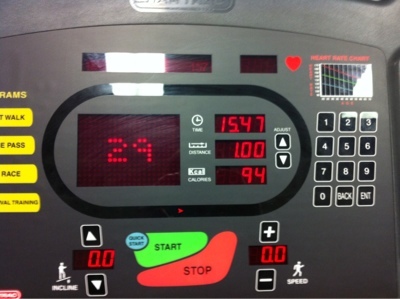 The other night while I was at the gym, I decided to complete a mile as fast as I could. My time was 15 minutes and 47 seconds. Now that I have a baseline, shaving time off of my personal record (PR) will be something else I can work toward while I'm at the gym! Great job! And keep trying with the food, I'm working on that too!